Good for you on starting the Bobbsey Twins books. Good for you playing softball. Glad you’re enjoying it. I was not a big sports player though I do enjoy volleyball. I love serving the ball. Great picture of you playing catcher. You’re doing a great job on the blog. Keep it up. Hi Delaney – I’ve never read The Bobbsey Twin books and have always been curious about them. I think you have inspired me to do just that! My daughter’s favorite colors are blue and purple and green! I never played catcher. is it kind of scary sometimes when the ball is coming toward you? Is it super hot wearing the gear? I love your new blog – it’s awesome! Delaney, I loved the Bobbsey Twins books, too. 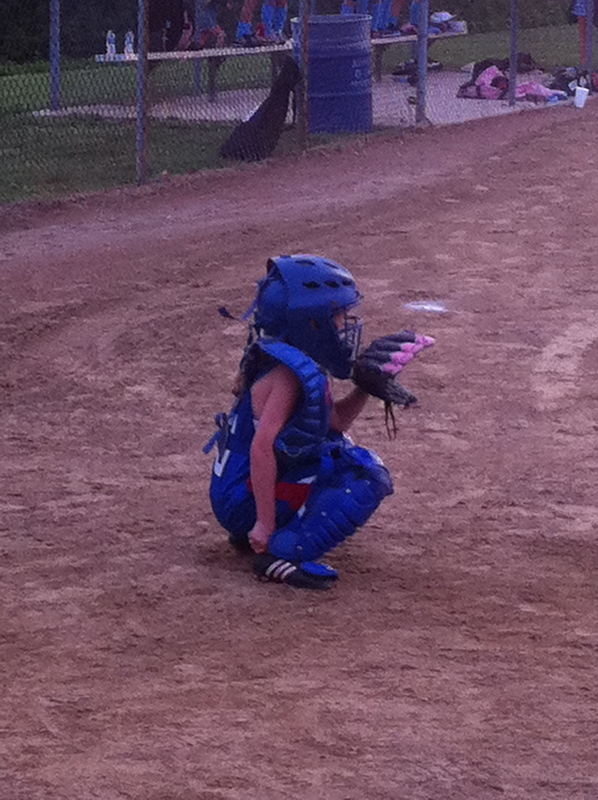 My son played catcher. It’s a hard position so good for you! What a great picture and post! I agree with Todd – you are doing a fabulous job! I’m so glad you are reading the Bobbsey Twins. What are Nan & Bert & Flossie and Freddie doing in this book? You look terrific in your catcher’s gear and Mommy tells me that you are playing really well. What have you been doing at VBS? The Bobbsey Twins were my favorite books! I read almost all of them. I know you will enjoy them! Awesome picture of you as catcher & wearing your favorite colors! My favorite color is PURPLE. Keep on blogging! You are doing a great job! hi delaney. my favorite colors are green and black. See u at VBS. from Avery S.
Hi Delaney…I’m a parent educator with the parents as teachers program…and I think your blog is awesome!! My daughter Libby is 14 and she’s the catcher on her softball team. You have to be tough to catch in softball, good for you!